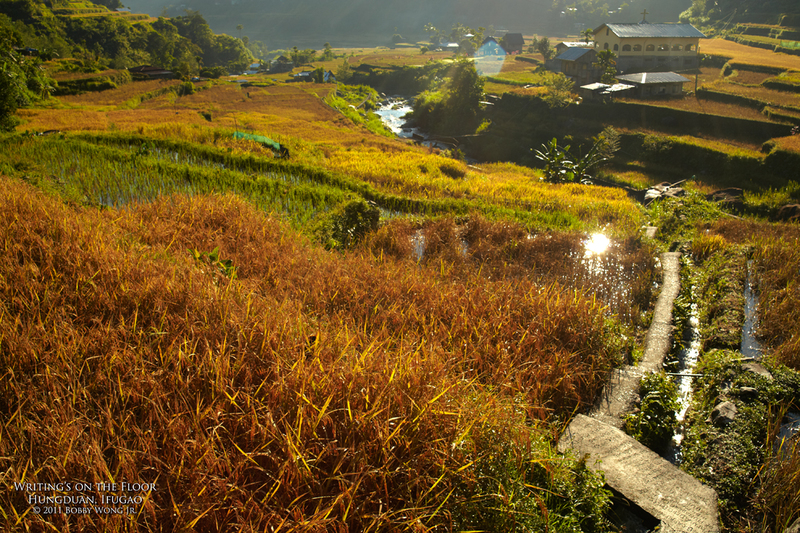 I awoke before sunrise and headed up the Hungduan Terraces towards a pregnant field awaiting harvest. My guide led me up the slopes along a narrow trail, most of which looked like the concrete path you see above. The light was absolutely golden, and in my trance and haste trying to catch every single scene, I forgot to clasp my waist pouch properly, and promptly dropped one of my rare prized lenses. I heard a spine-tingling thud and then saw my lens roll towards the slab's edge, towards a turbulent stream of rushing water about a meter below where I stood. Luckily, my guide lunged at & saved it just in time. Lesson learned? If you're not careful, it will cost you a big tip! Life goes on. Enjoy.